Atui is the third largest and third most visited of the Cook Islands . That doesn't mean it's busy though...typically there are around 50 visitors a week. The island is about half the size of Rarotonga. Legend says Tangaroa, the divine god of the sea, was the first inhabitant. Captain Cook was the first European to sight the island on 31 March, 1777. Surrounding the plateau is a ring of taro water gardens and then the jungle-clad makatea (fossil coral reef). Notched into the cliffs of makatea are over 28 beaches which, albeit small, are untouched and almost unvisited. The Rarotonga Flycatcher (Pomarea dimidiata) is officially classified as an endangered species. But a few years ago, it was on the verge of extinction. Then between 2001 and 2003, 30 of the remaining birds were transferred from Rarotonga where they were prey to the ship rat, to Atiu where the predator doesn't exist. Thanks to careful conservation management, there are now thought to be about 200 birds in existence. The International Union for Conservation of Nature and Natural Resource has more information. The kopeka (pronounced coo-peak-a) or Atiu Swiflet is Atiu's signature bird, and just like a bat, it can navigate in pitch blackness. It builds its nest deep in between the stalactites of two caves on the island where it lives, and finds its way around using the echo of a unique clicking sound that it makes. The Cook Islands Natural Heritage Trust director, Gerald McCormac says it's now the country's most endangered endemic species. He estimates there are just 440 left. One of the home caves is above left. Atiu was once a volcano which sank leaving a coral reef around a low plateau. 100,000 years ago, volcanic action pushed it up killing the reef and creating a razor sharp band of coral called a makatea. The makatea runs around the island ranging in width from 50 to 100 metres. Low cliffs, 3 to 6 metres high surround the island, but there are many recesses in which small sandy coves like the one on the left are found. 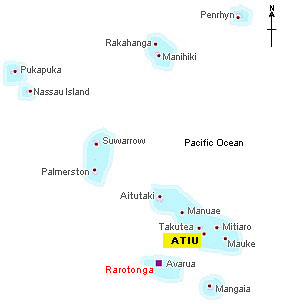 Atiu's five villages of Areora, Ngatiarua, Teenui, Mapumai and Tengatangi form a man-like figure in the centre of island. Coffee really does grow on trees in Atiu, it's totally organic and the Islanders are justly proud of their produce. "Atiu Coffee" is one of two types unique to the Island and it's known as a gourmet variety in many parts of the world. The Atiu Coffee Factory also has a coffee tour available that ends with you drinking cups of coffee in the fantastic Atiu Fibre Arts Studio, where you can learn about the craft of tivaevae. "Atiu Island Coffee" is produced by Mata Arai in the Atiu traditional method of roasting in coconut cream over an open fire. Take Mata's tour and learn how to process your own coffee and enjoy fire roasted coffee with coconut cream and pikelets (and if anyone from Staffordshire, England is reading this...yes, they're similar to the pikelets you get back home!). CAVES, COVES, CORAL AND...THE BIRD THAT THINKS IT'S A BAT! Limestone caves are found all over the makatea. Some are used as ancient burial sites and others, like the one on the right, are water filled and ideal for a refreshing swim. The island is also known as Enuamanu which means land of the birds. More species live there than on any of the other islands, and they include some of the world's rarest. But there's much more to Atiu than just birds, as you'll find out. Bush beer is a lethal local conconction that dates back to pre-missionary days. And drinking it is a tradition that's now a tourist attraction. Atiu boasts seven tumunus or bush beer schools. Everyone gathers round a barrel which these days is more likely to be plastic than the hollowed out trunk of a coconut tree as in the old days. The "barman" hands out the drink in a coconut shell. Once emptied, it's handed back, refilled and passed to the next person...and so it goes on, round and round...a bit like the school itself after you've drunk a few shells-ful. The drink itself is made either from fermented bananas or simply a home brew which is served very young. Either way, it's very alcoholic! When the barman taps his shell against the barrel, everyone falls silent for a short prayer and afterwards he introduces the drinkers to each other. Then everyone starts sharing stories about their own country and customs (hence why this is called a school), before the singing starts accompanied on ukeleles, guitars and the umba (a home made bass). There's no charge for the drink, but it's customary to compensate your hosts with at least NZ$5....or the equivalent in sugar. Internal airline, Air Rarotonga operates several flights a weeks from both Rarotonga an Aitutaki. Flying time in each case is about 45 minutes. And you can easily combine a trip to both islands. When travelling from Aitutaki, your plane passes the country's two uninhabited islands, Manuae and Takutea. "Atiu has positioned itself as an Eco-Island trying to attract the nature enthusiasts and those seeking a natural unspoilt island. This we do well with caves, secluded beaches, pristine tropical jungle, the weird shaped makatea, little commerce and very friendly people. We are trying to retain our differences from the rest of the world. This is hard to do. At best we are about 35 years behind the modern world and enjoying it. You will notice the refreshing difference"
The people of Atiu have created their own web site which tells you everything you could possibly want to know about the island, the residents and their lifestyle. There are also plenty of pictures, details of accommodation and an airline timetable. A credit to the islanders and very highly recommended! And I gratefully acknowledge their permission to use some of the pictures from their site on this page.